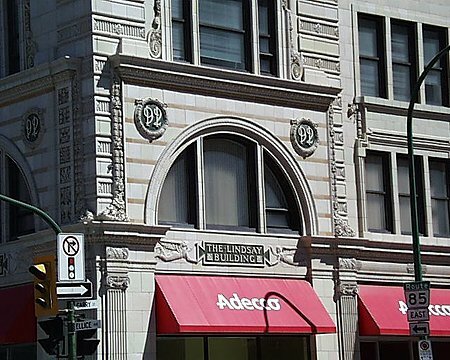 Located at the intersection of three major thoroughfares in downtown Winnipeg, the Lindsay Building is one of a handful of terracotta office towers erected during the city’s pre-World War I development boom. Featuring a steel frame with reinforced concrete slab construction, and a cream coloured terra cotta finish; the building was constructed at a cost of $193,000.00. After conversion to apartments, the main external alteration to the building was the replacement of main-floor windows and the closing off of some entrances.